If you have prior experience in using Windows devices, you know how slow these machines can get if you already have a lot of installed programs and files. Despite the massive advances that we have seen on Windows devices the past few years, Windows 10 computers still have slowdowns after a year or so. The slow performance can affect the tasks and activities that you do on your Windows 10 computer. Sometimes you may eventually have to recover Windows 10 files which are lost due to mistake. This is why it is normal for computer users to constantly search how to improve the speed of your device. 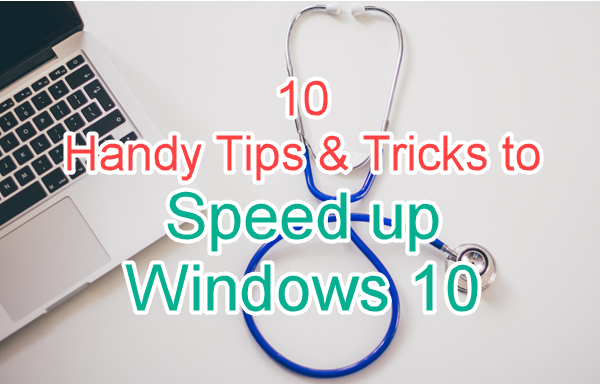 In this article, we explore 10 tips to speed up Windows 10 laptop and desktop. While a computer can survive up to a few days without shutting down or restarting, that is no excuse for you to leave it on for an extended period of time. Even just a few hours of rest every day is already a big help for the computer’s performance parts. Additionally, shutting down and restarting also helps clear system memory that accumulates as you use it. It also ends performance-slowing processes on the PC. Utilizing multiple apps at the same time can have a big impact on your RAM usage. While it boosts your productivity, it can take its toll on your computer’s performance. You can check your Task Manager to see which of the apps are the heaviest on your RAM so you can close it. As efficient it is to have your most-used applications and software open when you start your computer, it does make the start-up process longer. This is also among the most visible instances when you will witness how slow your Windows 10 device to boot. Simultaneously press Ctrl + Shift + Esc. This will open the Task Manager. Go to More Details. Proceed to the tab labelled Start-up. To disable the app from loading, right click the name of the app and select Disable. Live tiles are useful as it keeps users updated with information from certain apps. But it does have an effect on the performance of the device. To switch it off, click Start menu, then type Edit group policy and hit Enter. Find User Configuration and then Administrative Templates. Double click to open Start Menu and Taskbar, then open Notifications and click Turn off tile notifications. Find the Performance Options window. Once there, switch to the Advanced tab. Set your preference on which programs and services to run. If you tick off enough programs, it can speed up Windows 10 laptop. One of the key things that you can do to prevent slow performance of your Windows 10 PC or laptop is to do regular updates. This makes the security and protection of your system at a high level. Make sure you did not disable Windows 10 update. You may also want to do scans to remove malware. You can use Windows Defender and another antivirus software for this. If you choose to hibernate or sleep your laptop, there will be less time needed to turn it on. This means that the current state of the system will be saved to the hard drive and will easily load. Find OneDrive. Right-click it and tap Choose OneDrive folders to sync. Uncheck Sync all files and folders in OneDrive and then tap Ok.
Fast Startup as it speeds up the booting time of the Windows 10 device. While it is automatically enabled for most devices, you may still want to check whether it is switched on in yours. Go to Control Panel > Hardware and Sound > Power Options settings. Unlock the configurations by clicking Change settings that are current unavailable. Go to PC and then Properties. Find Advanced Systems Settings and then Settings (Under Performance). Go to the Performance Options window and tap the button “Adjust for best performance.” There are also more options that you can customize. If you have been using your Windows 10 PC or laptop for a year or two, you will notice that the speed of your device’s performance will decline. This is normal as with other devices that have accumulated a lot of software installations and files over the months. You can refer to how to free up space Windows 10. What’s more, in many cases, it is the USB flash drive that slows down your work, your can try some methods to fix slow USB transfer speeds. There are a lot of strategies and methods that can help with the slowdown of your computer’s performance. Got something to add? Drop some of your suggestions in the comments section.